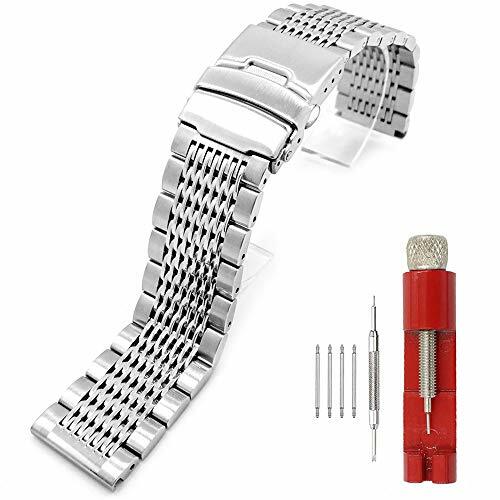 This is a premium stainless steel mesh watch band. The bracelet is solid and heavy duty with double lock clasp. It features a combination of functionality and style. All regular watches with straight lug ends and corresponding lug width (Not for curved edge or other special designed timepieces). Band length can be adjusted by the link removal tool (which is coming with the band). The band has 8 links can be removed, so you can adjust the buckle to perfectly fit your wrist. Please pay attention to the direction of the arrow on the band links when remove. Assemble the spring bars to the both ends of the band then use the spring bar tool to lock into your watch's lugs. Adopts unique double button buckles folding clasp, firmly closed, and prevent loosen automatically. Outstanding bright excellent brushed matte finish, provides smooth touch feeling. Adopts fashion color blocking design, stylish delicate, elegant and trendy looking. Made of high-quality stainless steel to guarantee longtime use. Waterproof and anti rust. Top Quality: Crafted from premium 316L stainless steel with exquisite mesh craftsmanship; feels solid, heavy and comfortable on your wrist. Fashion Design: Adopts unique double button solid buckle and security folding clasp, firmly closed. Fashion brushed matte finish, stylish delicate, elegant and trendy looking. Easy Installation: Coming with spring bars and tools as gifts to make you install quickly and easily. If you have any questions about this product by Kai Tian, contact us by completing and submitting the form below. If you are looking for a specif part number, please include it with your message.